Dedicated to the memory of Audrey Faye Pidde, a life long resident of Akeley, Minnesota. After a heroic battle against cancer Audrey passed away on March 24th 2005. One of Audrey’s last wishes was to go to Alaska. 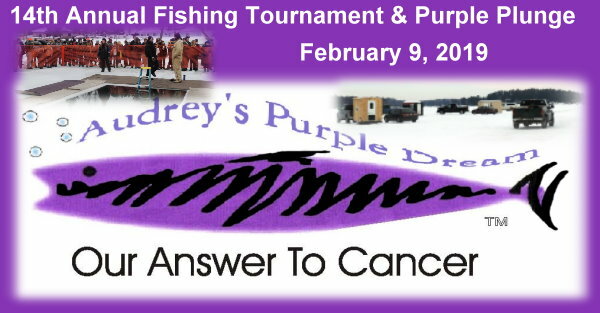 Audrey had many friends and many family members who helped make the original Purple Dream happen in February of 2005, on the 11th Crow Wing Lake. The event raised almost $10,000 to send Audrey to Alaska. Unfortunately the cancer didn’t give Audrey enough time to realize her dream but the money raised did make a huge impact on the last few weeks of Audrey’s life. It enabled her to pay medical bills and other expenses, giving her some peace of mind, and most of all it let her know how much people care. Now the Annual Purple Dream will raise funds to help other local cancer victims and their families. You can go to audreyspurpledream.com to print out a plunge pledge sheet & a registration sheet. Don't forget to find them on facebook!